The Destiny trilogy left the Star Trek universe in a shambles, leading to the rise of a new power bloc, the Typhon Pact, in A Singular Destiny. Now, some of Trek literature’s most lauded writers have cast a spotlight on that alliance in the Typhon Pact miniseries. Among them is Dayton Ward, who’s contributed the final book, Paths of Disharmony. He kindly agreed to talk to Unreality SF about the book, the state of the Star Trek universe after Destiny, his upcoming works in the Vanguard series, and his original endeavours. There have been voices in the Trek literature community criticising the novels for becoming too dark in the last few years. What’s Dayton’s stance on that argument? “Well, Destiny was a game-changer, and dealing with the fallout of those events will take a while to sort through,” he muses. “One of the core tenets of Star Trek is that at some point in the not-so-distant future, we’ll emerge victorious from one of the darkest, most trying times in our history, and eventually become part of something greater and grander than our little planet here. Speaking of which, Dayton is involved with both of this year’s Vanguard offerings – June’s Declassified, an anthology of four novellas written by David Mack, Marco Palmieri, Kevin Dilmore, and Dayton, and What Judgments Come, a full novel scheduled for October, which for a long time was known only by the working title The Taurus Key: A Crystalline Fairy Tale, Founded Upon The Mysteries of the Shedai and the Oppression of Their Servants. It Was Written for Kollotuul, But Others Should Read It. Was there ever a chance for that title to stick? “Only if our editor was Steve Mollmann,” Dayton laughs, giving a shout out to his fellow Star Trek writer, who inspired it. Dayton’s contribution to Declassified is titled Almost Tomorrow. He reveals that he “really wanted to do something set before the events of the series’ first novel, Harbinger. I borrowed an idea from a television series I really like, The Shield. During that show’s second season, they aired an episode called Co-Pilot, which took several steps back to the timeframe just before the series’ first episode and showed us how various key characters came to be where they are at the point we are introduced to them in the pilot. It’s not a ‘big story’ in and of itself, and absolutely doesn’t work if you hadn’t been following the show from the beginning, but it added some nice context to certain characters and ongoing storylines from the show’s first two seasons. “I thought that a similar setup would work for a Vanguard story, let me flesh out a few bits of backstory for some of the series’ characters, and show you the motivations and circumstances that put them where they are when we’re introduced to them in the first Vanguard novel. 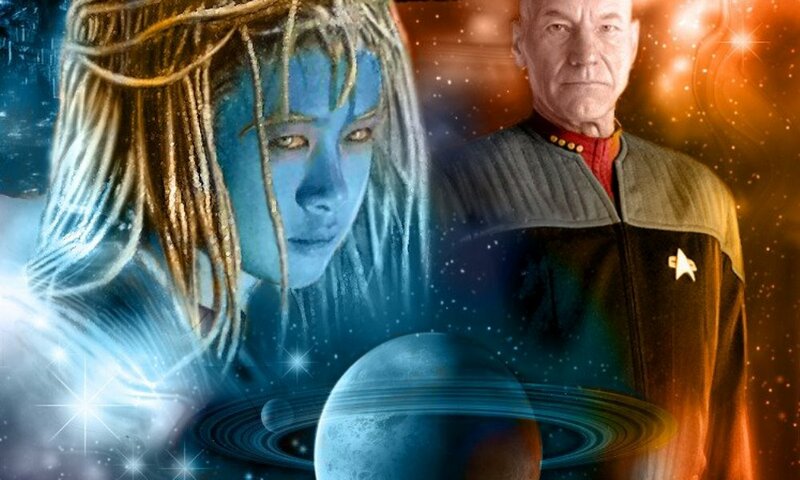 Savvy readers who’ve been following the stories Kevin and I have written for other Star Trek projects over the years also will recognise elements from one of our earliest works, which fate has now conspired to let us revisit as a very natural outgrowth of the Vanguard series. It’s weird yet very fun how that sort of thing works from time to time. This allowed me to plant a few more seeds that Kevin and I in turn will be utilising in our next full novel for the series. So, the stories will cover the entire history of Vanguard, from before Harbinger until after Precipice. Will they directly tie in to the main storyline, or are they independent stories? “Yes. How’s that for being irritatingly vague?” Dayton smiles. While Marco Palmieri’s story in Declassified marks his debut as a writer within the Vanguard series, as its co-creator he was involved from the start, along with David Mack; and Dayton and Kevin came on board very early on, too. Where there ever discussions about inviting a Vanguard-newbie to participate in Declassified? “Yes, we did originally consider bringing in some other writers,” Dayton nods. “We were tossing around different ideas as to what format we’d use for the stories, such as a short story anthology, and even a pair of mass-market paperbacks with two short novels each, mimicking the approach used for the Worlds of Star Trek: Deep Space Nine collections. Now that Admiral Nogura has been the commander of Starbase 47 for a while, and Dayton has had the chance to write him repeatedly, what are the major differences between him and his predecessor Diego Reyes in Dayton’s eyes? “Nogura is a little bit country, whereas Reyes is a little bit rock-n-roll,” he jokes. “In all seriousness, Nogura is much more experienced than Reyes, both in diplomacy as well as the Starfleet/military side of things. In other novels, he’s been described – yet seldom, if ever, seen – as one of Starfleet’s senior advisors. I see him as very deliberate in his decision-making, considering all the angles and not always letting on what he’s thinking when he sets into motion various courses of action. Despite the upheaval in the Star Trek editorial office, Dayton has more Star Trek projects in the pipeline, but he’s “not currently at liberty to discuss them”. Luckily, he’s also very active outside the Trek universe, so there’s more than enough to talk about, including Counterstrike, the 2010 sequel to his first original novel The Last World War. There were almost seven years between the releases of the two books. What were the reasons for the long delay? “The first book was commissioned as part of a programme Pocket was running to publish original science-fiction and fantasy as written by authors already working for them in some capacity, such as media tie-ins,” Dayton explains. “Peter David, Susan Wright, Keith DeCandido, and myself all were among this initial group, with our books being edited by John Ordover. As I was finishing writing The Last World War, a decision was made to scrap the programme and just concentrate on media tie-in SF and fantasy. So, here’s a bunch of books hitting shelves, all of which were written with the intent of possibly launching their own multi-book series, with nothing coming after them. Then John left, and my book and its potential sequel(s) essentially became ‘orphaned’ at Pocket. “Marco Palmieri took up my cause and repeatedly tried to get his bosses to green-light a Last World War sequel, but this or that set of circumstances would always derail it,” he remembers. “This, despite the fact that the book was and continues to sell quite well. Then, as you know, Marco left Pocket as a casualty of downsizing, and I was pretty sure that would be it for any sequels to that book. After all, what publisher is going to buy a sequel to a book they don’t already have in their catalogue, especially if it’s from a mid-list writer like me? Answer: Nobody. “Enter Jaime Costas in early 2009, who by now was working as an acquiring editor at Pocket. She contacted me and told me she wanted to commission the sequel, and we were off and running. The rest, as they say, is history,” he smiles. And since Dayton would like, “somewhere in and around all of that, my regular full-time job, and my family… to sleep for a few hours, too”, it’s thank you and goodnight. Paths of Disharmony was released by Pocket Books in February 2011. Declassified and What Judgments Come will be released by Pocket Books in June and October 2011 respectively.